Fact about German Poppy Seed Cakes: Poppy seed cakes originate from the Silesia and Poland. As these particular regions always been shared with (or invaded and occupied by) Germans and Austrians over centuries this cake had become part of the German cuisine. 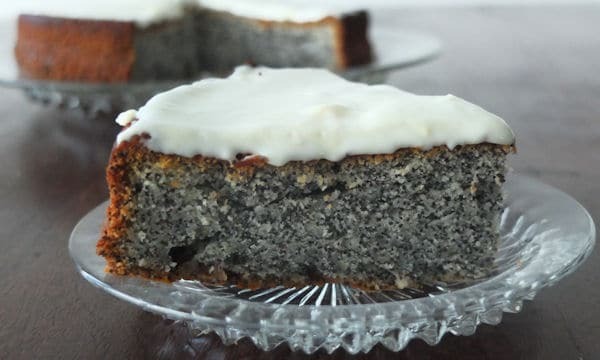 This German Poppy Seed Cake Recipe is a lighter version. We have added yoghurt to the dough to make the cake fluffier. It took me a long time to decide which icing to choose. I’m quite capable of making a cake taste delicious but I am a self-confessed failure in decorating them. My husband would probably say its due to my lack of detail and patience. However this lemon and cream cheese icing is so easy that even I could not get it wrong. I brought this cake to my friend Alessia’s birthday party who was unfortunate to have to share it with a double murder investigation right down her road. Yes it was the same double murder that happen in Leytonstone last week. Read about it here. Thank god the police did not question me about the contents of the cake when I arrived. Poppy seeds has many uses… I really hope they catch the murderers soon. Mix 200 gr butter, eggs and caster sugar to a mass. Add the yoghurt and poppy seeds and mix well. Pour the cake into a greased cake tin. Bake at 180 degrees for about 50 min. While the cake cools down fold the lemon juice, the remaining lemon zest, and vanilla flavoring into the cream cheese. Now gradually add the icing sugar until you achieve the desired consistency. 6 Responses to "German Poppy Seed Cake with Lemon Cream Cheese Icing"
The German poppy… looks delicious!! I forgot to rate the recipe. It looks really easy to follow and I think even the novice would have fun preparing this dessert! Oh, YUM! I love Mohnkuchen of just about any kind. Hi, could you give a link to the normal recipe that isn’t “light”? I prefer the really rich, buttery version.